I have the greatest admiration for sculptors that seem to have an intuitive grasp of facial anatomy and character. Granted, this is usually due to years of study and practice. I struggled for a long time with faces until I discovered a book at an art supply store entitled “Modeling a Likeness in Clay” by Daisy Grubbs. Here I found a method to suit my rather mathematical and non-intuitive nature; a means by which facial anatomy can be measured and reproduced, or at least a way to get a solid basis for a portrait. While the book is written with the traditional, large clay busts and live subjects in mind, the techniques presented apply readily to miniature sculpture with polymer clays such as Sculpy. The very talented David Whitford, has commented in conversations and demonstrations at club meetings, that he routinely models his faces on living people to imbue them with real personality. Using the methods from the book, I decided to model faces on actors, images of whom are widely available on the internet. Once cast in resin, these heads can serve as a cast of characters for many subjects, beyond those they have portrayed in film and on TV. Of course there are some historical personalities of whom there are many available photographs to work from. Erwin Rommel and T.E. Lawrence spring to mind, as both were often photographed for propaganda purposes. The first step in creating a likeness, is to gather photos of the subject. A search with Google Images will usually produce dozens of photos, depending on the level of celebrity of the subject. Try to find good, 90-degree profile views, and shots looking directly into the front of the person’s face. Unfortunately, views from an quarter-angle are more common in portraits and publicity shots, but these can be useful too. I use a photo editing program similar to Photoshop to crop the pictures and resize them so they are one inch from chin to crown. This will give you a head that is roughly 1/9th scale. To help make the photos all the same size, turn on the “grid” feature of the editing program, and align facial features in the photos, like the mouth, the bottom of the nose, and the eyes, with the other images. It is from these photos you will take the measurements on the chart. Include larger photos for details, and print this out for a handy reference. keeps the clay from turning on the wire, especially after it is baked. Clay is applied to the wire in a crude approximation of a human head and neck (fig. b), and baked to hardness; 275 degrees for 15 minutes. This provides a solid foundation for the next layer of clay, and should be much smaller than the complete head size. After building up the basic head shape with a little more clay, I’ve inserted two small pieces of wire on either side (fig c), this represents the position of the ear holes, and is the common point from which to measure the proportions of the head. In fig. (d), I’m measuring the width of the head from ear to ear with calipers. Add clay, or remove with a wire-loop tool to achieve this measurement. In fig. (e), I check the distance from the ear to the forehead/hairline with dividers, and build up that area. Figure (f) shows doing the same with the chin. Measure from both ears to the feature, and continuously study the head from above and below with an eye to keeping the areas even and symmetrical. It’s helpful to think of the skull as a sphere (the cranium), sitting atop a cylinder formed by the jaws and teeth. Taking a fine pin or needle, make a line from one ear post, over the top of the head to the other. Next make a line from the top of the head running forward down the center of the face. This serves as a guide to the placement of the eyes, nose, and mouth. In fig. (g), I’ve marked the hairline on the vertical line, and added a little more clay to the chin. After smoothing the clay a bit and redrawing the vertical line, I mark the distances from the chin to the mouth and bottom of the nose. 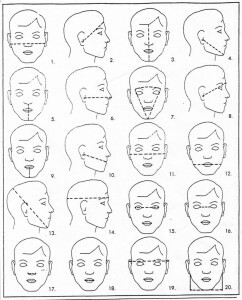 Setting the dividers to the distance from the chin to the brow ridge, place one point lightly on the chin, and score a line that arcs through the center-line of the face (fig. h). At this point, begin to roughly shape the planes of the face and general features (fig. i ). It’s important to concentrate more on achieving the general shapes and measurements at this point than refining details. Continue to measure the width of the mouth, size and distance between the eyes, and re-check the measurements to the ear-posts to make sure these haven’t changed as you push the clay around with your tools. As you work on the facial planes, keep in mind that the cheek bones curve around to the sides of the face; that the mouth forms a horseshoe shape when viewed from below the chin, and that the wings of the nose sweep back from the frontal line of the face when viewed from the side. Study the head from different angles and compare to the general lines of the subject in the photographs. Another helpful technique is to look at the head in a mirror. When you concentrate on something like this for any length of time, your brain tends to “correct” errors and mentally compensate for differences. Looking at the sculpt in a mirror or a photograph will trick your brain into seeing it as it is. In figure (j) I’ve smoothed the surfaces a little more, and started to add detail and character to the features. The face begins to look familiar due to the shape and arrangement of the features, but it really takes on a likeness with the addition of a squint. In figure (k), the nose is refined more, and the actor’s characteristic cheek creases are defined. Figure (l) shows the view of the front, and I’ve added a snarl; another typical expression. Checking this in the mirror, I notice that the nose is crooked, and can correct it. Once satisfied that no more major corrections need to be made, I make a little sausage of clay, and wrap it around the rear of each ear post to serve as the foundation for the rest of the ear. After the posts are removed, these are blended in and shaped. This will help keep the ear “conch” from laying flat against the head. I bake the piece at this point. Next, the ears are added (this is where a photo or drawing of an ear comes in handy), and features are shaped and smoothed with files, sandpaper, scouring pads, and an old toothbrush (fig. n). If you need to add more clay to build an area up, put a little Testors liquid cement or lacquer thinner on the area to help it adhere, then smooth the edges with a paint brush lubricated with Vaseline. Excess Vaseline will be absorbed or evaporate when the piece is baked again. Figure (o) is a final view from the front. The Sculpy still looks pretty rough, but there is a chance that further sanding and smoothing will alter or damage the detail. At this stage I prefer to make a mold of the head in RTV rubber, and make a casting in resin. Further smoothing and minor changes can be accomplished with epoxy putty (and don’t forget that mole!). I find it easier to complete the hair and headgear in epoxy putty and other materials.